The blogging space has grown to be a major part of online publishing with a huge following and audience. On WordPress blogs alone, over 409 million people view more than 20.4 billion pages each month. With Blogger and Tumblr, the total audience is much larger. In terms of content, the blogging space captures every imaginable content category and topic from tech to sports to fashion to food. Advertisers have partnered with bloggers for years, particularly in the women’s lifestyle space, because of the highly targeted and desirable audience (women 18-34), the association with premium content, and high social engagement. With new developments in the advertising space courtesy of ad blocking and women’s lifestyle bloggers going mainstream, sponsored content with bloggers has become an increasingly viable channel for brands to reach and engage with their target audiences. Sponsored content with bloggers can often look like “native advertising,” but are most often “sponsored posts” or collaborations where the blogger integrates the brand into their content while declaring the sponsorship and brand association. Influencer marketing has been on the rise with brands exploring sponsorships with YouTubers, Instagrammers, Viners, Snapchatters, and every other emerging social platform. Bloggers are in many ways the first influencers, and brands started these partnerships as early as 10 years ago. Bloggers have advantages over many of the other platforms, including favorable audience demographics, clear content parameters (vs. video, streaming, Snapchat, etc. ), embeddable tracking links, and oftentimes large adjoining social media channels. With the rise of new social media channels, influencer marketing company Mediakix evaluated who’s advertising with bloggers and how this space has grown. Our study, which spans the first half of 2015, offers targeted insight into how the biggest and breakout brands are leveraging blog advertising in innovative ways to drive both e-commerce/response-based and branding initiatives, as well as capture audiences in the tens of millions of readers. Our recent market research study identified and analyzed all sponsored content from the top 100 lifestyle bloggers, discovering new data finds and trends about blog advertising. Here are the major takeaways from this new market data, complete with an infographic breakdown. A total of 34 advertiser categories represented nearly 800 sponsoring brands. All brands were categorized by primary advertiser categories, and if needed, a secondary advertiser category was applied. For instance, BarkBox was first categorized as a pets advertiser, then second, a subscription service. Other top blog advertisers include: Disney, Silk, Home Depot, HP, Minted, Squarespace, and Zappos. Of the nearly 2,000 sponsored posts, five sponsored blog formats were identified. These are sponsored post, giveaway post, contest post, collaboration post, and event hosting post. Brands are increasingly working with bloggers on deeper collaborations to build awareness and leverage bloggers’ own brand appeal. These collaborations include events, signature lines, and longer term sponsorships. Collaborations are also a growing category, where brands will partner with bloggers to debut a dedicated blogger-brand product or service. A prominent example includes lifestyle blogger and founder of Cupcakes & Cashmere Emily Schuman’s collaboration with Nordstrom. Contests and giveaways are effective blog advertising formats driving high-reach monthly page views into social shares, engagement, and conversions. This type of sponsorship can deliver very specific goals that may include site visits, email registrations, social follows, and more. With ad blocking on the rise (a recent poll showed 40% of millennials using ad blockers) and bilions of advertiser dollars caught in the balance, advertisers are desperate for channels that can reliably reach audiences, especially in millennial and upcoming younger demographics. Although a Nielsen study showed millennials as the demographic most likely to trust advertising, there’s a caveat: They don’t want ads—they want stories and contextual relevancy to their lives. In order to retain and drive meaningful engagement online, advertisers are proactively seeking out bloggers and lifestyle blog sites to not only drive conversions online, but provide the much-needed relevant storylines and lifestyle context audiences seek. 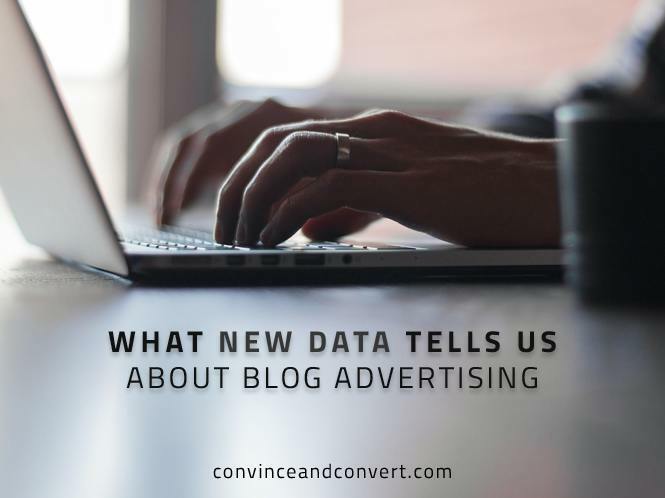 Bloggers go beyond views and impressions to provide sponsoring brands relevant storylines, engaging conversation, and audience participation resulting in profitable conversions. While food and fashion brands have always been prominent advertisers, a survey of the top brands advertising with bloggers finds the rise of subscription-based advertisers. Subscription services, perhaps fueled by the success of Amazon and the convenience of home delivery, hit mainstream traction in 2012. Since then, there has been no shortage of curated or specialized subscription box services (Think Ipsy from top YouTube influencer Michelle Phan or Birchbox Man, the male iteration of the hugely successful beauty/personal care box). Out of the top ten advertisers, two are subscription service brands, with the secondary advertiser category accounting for a significant 15.6%. Brands like NatureBox, Freshly, Le Tote, and Kiwi Crate typify breakout brands advertising with bloggers to drive direct conversions. Many brands are well-backed and structure their advertising to be cost-per-acquisition (CPA) effective—keen to drive the most amount of ROI for their ad spend. In spite of being the oldest category of influencers, blog audiences are still growing and reaching tens of millions of readers. They’ve become increasingly relevant with the rise of ad blocking and the evolution from simple broadcasting by advertisers to richer, socially engaged sponsorships and storytelling. The new data finds from our study show wide interest from a diverse group of advertisers, from the world’s largest brands (Coca Cola) to fashion brands (Nordstrom, Old Navy, Express) to fast growth e-commerce companies (Blue Apron, NatureBox, etc.). From the interest of this broad group of advertisers, it seems that sponsorships with bloggers can balance the often mutually exclusive categories of branding and direct-response, as well as tie in social engagement and relevance. With media becoming increasingly digitally focused, blog advertising offers a scalable and viable solution for advertisers. We expect to see continued growth in this category with more and more brands leveraging the space.